It’s the time of year again for fresh fruit, vegetables, and other groceries supplied by the annual Fredericksburg Farmer’s Market. Making a trip to Hurkamp Park in Downtown Fredericksburg to purchase produce or just browse among the vendors will definitely be worth the time. The Hurkamp Park location opened on April 15 and will be in operation between 7 a.m and 2 p.m. Monday to Saturday. Two other locations will open in subsequent months at Mayfield and Mary Washington Hospital in May and June, respectively. Additional information about each location is listed below. 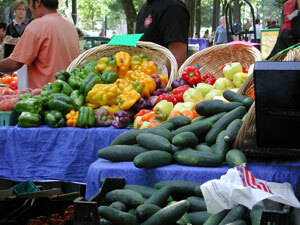 Eating locally has become an increasingly popular trend with many potential benefits. Shopping at any one of these locations will stimulate the local economy and increase support for nearby farmers, not to mention the added perk of lower prices. Additionally, farm fresh vegetables, eggs, meat, and bread — among other groceries — encourage more nutritious meals and healthier eating. 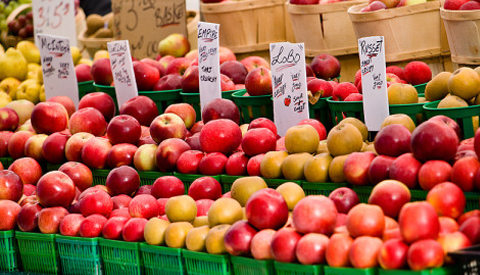 While the vibrant colors of assorted produce and plants are certainly an impressive sight, the multitude of vendors are not the only thing on display downtown during this time of year. Fredericksburg’s tradition of displaying original artwork by local artists in Hurkamp Park will begin in May and be exhibited between the hours of 9 a.m and 1 p.m on every first and third Saturday of every month. Find out about the regulations for Art in the Park here. Open 7 a.m. through 2 p.m.
Open 3:30 p.m. through 6:30 p.m.
Open 1 p.m. through 5 p.m.